Sci-fi author Jay Falconer is opposing a trademark application from ZeniMax Media, Bethesda's parent company, over the word 'Redfall'. ZeniMax made the application last year, and there's a possibility it's The Elder Scrolls 6's official subtitle. The case could extend well into 2020, potentially stopping Bethesda from using the name in trailers, previews and whatever else it has planned. Noted by GamesRadar, the dates for conferences, disclosures and hearings run from March this year all the way until August 20, 2020. There won't be a trial or court appearances, as Falconer's publisher, BookBreeze, is opposing the application, not claiming that any trademarks have been infringed. 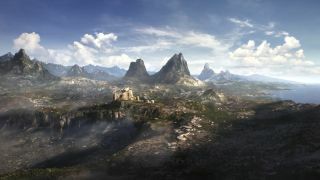 It should be emphasised that The Elder Scrolls 6's proper title hasn't been announced yet, and while Redfall sounds kind of Redguard-related (I mean, it's got the word 'red' in it), it's not an official area in Tamriel, as far as we known, which is what the games are usually named after. In response to the GamesRadar article, Falconer claimed that his lawyers approached ZeniMax to work out a licensing deal to use the Redfall name, but they were ignored. Falconer has written two books in the Redfall series so far. While this trademark dispute could potentially disrupt Bethesda's schedule, there's not even been a hint about the release year, let alone the release date. It's likely still very far off, trademark trouble or not. Here's everything we know about The Elder Scrolls 6. ZeniMax Media has yet to make a statement about the trademark application, but I've reached out to Bethesda for more details.